Take your experience to new heights with our VIP gondola. 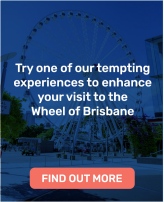 The VIP experience offers an extended ride duration lasting approximately 25 to 30 minutes, luxurious leather seats, tinted windows, a Piccolo of Sirromet wine or sparkling and your choice of audio (Brisbane tour or general music). Contact our friendly team to book your gondola. A ride on the Wheel is an uplifting experience that will take you almost 60m above the ground in the safety and comfort of a fully enclosed air conditioned capsule. You will be inspired by the breathtaking views across the iconic Brisbane River. The Wheel of Brisbane is proudly supported by the Seven Network.